Just in time for the start, the fog over Davos moved on and offered the athletes a beautiful backdrop. After last year’s exceptional weather conditions both athletes and race crew were more than happy that all distances could be organised as planned. In bright sunshine, co-organiser Sven Riederer prevailed in an exciting duel against Pieter Heemeryck. Marcello Ugazio from Italy completed the podium. Last year's winner Lena Berlinger defended her title in front of the Swiss Martina Kunz. As last year, athletes and organizers looked forward to the weather forecast for the race day in advance. But when the sun rose over the Swiss Alps on Saturday morning, worries about the weather were completely gone. The unique mountain scenery inspired athletes and spectators shortly before the start of their 1.9 km swim. After a little more than 24 minutes, a group of four with favorites Pieter Heemeryck, Sven Riederer and Julian Erhardt came out of the water of Lake Davos and attacked the 12km long climb to the Flüelapass. Riederer and Heemeryck quickly took the lead and they completed most of the 54 km long bike course with 1780 vertical meters together. After approx. 2:20 h they reached the new transition zone 2 in the Kurpark Davos just a few seconds apart. The two pros ran one and a half laps shoulder to shoulder. After 15 km Riederer was able to set the decisive attack. At the finish, the Swiss cheered wildly and celebrated his first win of the year, with a total time of 3:41:15. Belgian Pieter Heemeryck crossed the finish line 30 seconds later. With the fastest run split of the day, the Italian Marcello Ugazio won the 3rd place. Last year's winner Lena Berlinger left no doubt for who would win this race. She came out of the water with a lead of just over two minutes ahead of Swiss Martina Kunz and Lisa Roberts (USA). Strong mountain rider Berlinger controlled the two long climbs to Flüelapass the race at the front and needed only 2:09:35 for the bike course. With this Berlinger was able to start the final half-marathon with a big gap and ran the victory safely home. The Zurich-based Martina Kunz took the second place on the challenging bike course and did not relinquish this position until the finish. The German Anine Hell was able to secure the 3rd place ahead of Lisa Roberts. 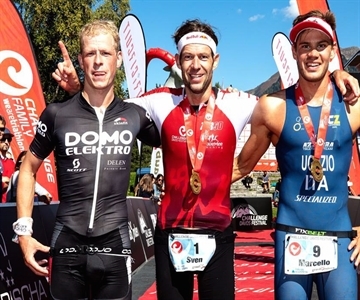 Parallel to the middle distance triathlon, an Olympic distance was held within the Swiss mass sports series TRI Circuit. Here the two Germans Timo Hackenjos and Ricarda Gümmer triumphed. Together the athletes closed the swiss triathlon season at the award ceremony at the Hard Rock Hotel Davos. On Sunday at the Challenge Davos Festival the Flüela Challenge is on the program. Here, the 12km long route to the Flüela Pass can be accomplished by bike, roll-skis, in-line skates or running. In addition, you can drive the Flüelapass on a traffic free course without timekeeping during the "Coop Ride the Alps".